The weight is 24 lb. Hope this helps! What is the weight of the paper? can I get an envelope #10 or #9 with window on the right? Hello, Unfortunately we do not offer this, and do not customize envelopes. Sorry for any inconvenience. Thanks! Item # 1633172 is this a double window envelope? No they are not. The only commercial window envelope we have are #10 size and can be found here: http://www.jampaper.com/Envelopes/10WindowEnvelopes. I need to know the exact paper weight for my printer to function with your #9 envelope. The exact paper weight is 24 lb. You can never go wrong with a white #9 envelope like this one. Whether you are in need of routine mailing such as sending checks or want to use this for more something more personal like love letters, these 3 7/8 x 8 7/8 envelopes will always do the trick. Sometimes ordinary is needed, especially if you're using an envelope for professional purposes. 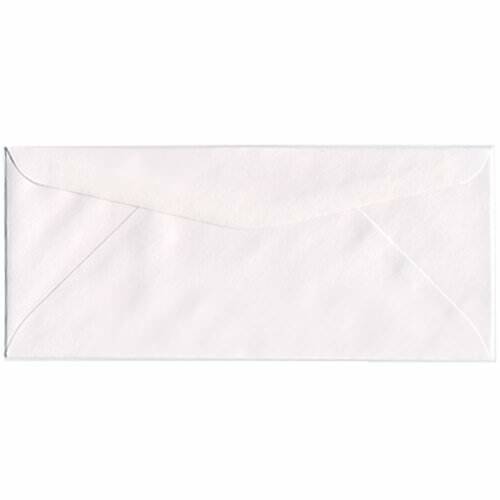 You'll be able to get the job done right with these white envelopes. The short v-flap will make for easy access and the smooth finish will keep all of your recipients interested to open the envelope. The white color will compliment any kind of message you're sending too! So don't go without the ordinary envelope when you're sending things inside of the ordinary, choose one of our #9 envelopes! White #9 Envelopes measure in at 3 7/8 x 8 7/8 and feature a shallow gummed v-flap. They are sold 25 to a box and can be ordered in amounts up to 1000. Great for commercial use!